When you’re the lead guitarist in New York’s coolest rock band, you need a cool guitar. Just as Epiphone started out in Manhattan, so did The Strokes. 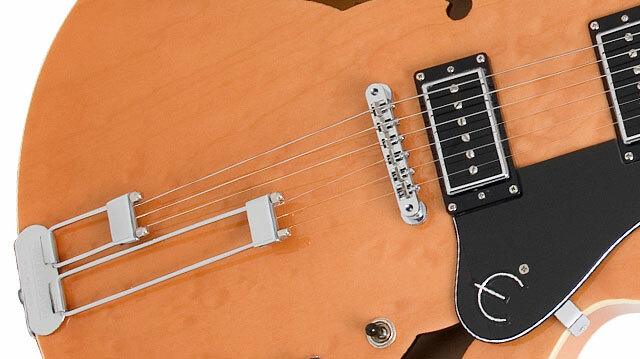 In 1999, Nick Valensi chose to play his incendiary guitar riffs on a customized Epiphone Riviera, one of our classic guitars from the Kalamazoo era. From the fuzzy stomp of “Last Nite” to the brittle groove of “Juicebox,” the Riviera is at the heart of all the band’s greatest moments. The Riviera was first introduced in 1962 and featured “New York” pickups, which resembled humbuckers but were actually single coil pickups with polepieces offset from the center. At first glance, Nick’s design doesn’t stray too far from the original. However once you plug in the P94, it’s clear that this is a totally unique and modern guitar that will make vintage Riviera owners think twice about owning an expensive vintage model they’re too afraid to take out of the house. The P94 is Nick’s main guitar on stage and he’s rarely seen without it at festivals or on television. Like all Epiphones, the P94 comes with our Limited Lifetime Warranty and is covered by the Gibson’s famous 24/7/365 customer service. 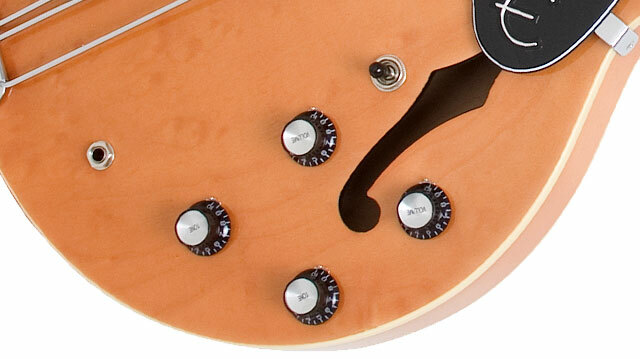 Cover all the “Angles” and visit an Authorized Epiphone Dealer today and pickup a Nick Valensi Riviera P94! True to the Riviera's roots, the Nick Valensi P94 is a stunning semi-hollow design that combines a lightweight mass with heavyweight performance. Laminate maple is used for the body and top with a 24.75" scale SlimTaper™ "D" hand-set mahogany neck and a fast-flowing rosewood fretboard with pearloid parallelogram inlays, perfect for the kind of finger acrobatics you hear in tracks like The Strokes' "The Modern Age." But it’s not until you fire the Nick Valensi Riviera P94 through an amp that you realize how hot this guitar really is. With a Gibson P-94T pickup at the bridge and a P-94R at the neck, you get wonderfully responsive tones. The wide tonal range of the P94’s and their ability to go from light to scorched Earth makes the P94 a formidable guitar for stage and studio. The P94’s superlative string tension and intonation is aided by our patent pending Tune-O-Matic™ bridge plus a classic Epiphone style trapeze tailpiece. 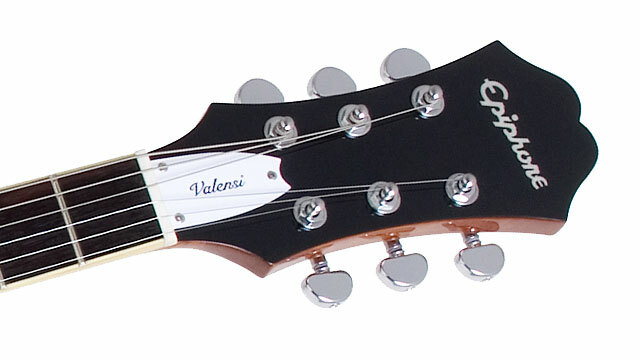 Grover® 16:1 tuners ensure steady pitch and are mounted on a classic Epiphone Sloped Dovewing headstock.